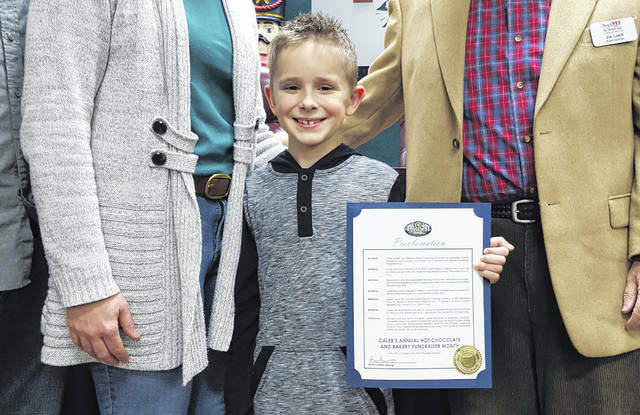 Caleb Sefcik, a second-grader at Scioto Ridge Elementary School in Powell, poses with the proclamation he received from Mayor Brian Lorenz during a ceremony held in the Powell Municipal Building on Dec. 28. Through his annual Hot Chocolate and Bakery Fundraiser, Caleb has raised nearly $1,600 over the past three years for People In Need, Inc. of Delaware County. While there are age restrictions that prohibit America’s youth from getting behind the wheel of a vehicle or stepping into a voting booth at an age deemed too young for such actions, nowhere is it written that one must be of a certain age in order to help someone in need. Caleb Sefcik, a second-grader at Scioto Ridge Elementary School in Powell, caught the service bug at the tender of 6 after asking his mother, Laura, a question that might catch most parents of youngsters off guard. That following Saturday morning, Caleb kicked off what has become his annual Hot Chocolate and Bakery Fundraiser. Held the first Saturday in December inside the garage of the Sefcik’s Powell home, Caleb has raised $1,583 over the past three years for People In Need (PIN), Inc. of Delaware County, a private, not-for-profit social services agency. What started out as a small fundraiser — neighbors and friends of the family helped Caleb raise $75 the first year — quickly grew to Caleb raising $440 the second year. This year, people who stopped by for hot chocolate and baked goods on Dec. 2 donated $1,028. “People we don’t even know make the baked goods and donate it to the activity, so it’s a complete community activity with everybody getting involved,” Mrs. Sefcik said. She added along with her husband, Sean, the couple is “bursting with pride” as their son’s idea has helped PIN assist countless county residents in need. While Caleb accepted the proclamation with a huge smile and a handshake from the mayor, he left the talking up to the woman who knows him best. Caleb didn’t need to take time to toot his own horn as Jim Lewis, a PIN board member, did it for him. Lewis said the money Caleb raised this year alone will provide approximately 500 meals to the 16,000 food-insecure people living in the county or help to keep four or five families from ending up out on the streets.